"Simeon and Levi are brothers - their swords are weapons of violence. Let me not enter their counsel, let me not join their assembly, for they have killed men in their anger, and hamstrung oxen as they please. Cursed be their anger, so fierce, and their fury, so cruel! I will scatter them in Jacob and disperse them in Israel." This tribe is not mentioned by Moses. When dealing with their allotment, two passages seem to be the most descriptive. These passages can be found in Joshua 15:20-32, and Joshua 19:1-9. Only the Joshua 19 passage specifically mentions this tribe. The reason for this is because the allotment of this tribe lie within the borders of the tribe of Judah. These two tribes, together with the tribe of Benjamin, are known as the Southern Tribes. The primary significance of this particular tribe rests not within itself, but its association to the favored tribe of Judah. The region encompassed by these tribes has been called the kingdom of Judah as well, though the exact nature of the borders within each tribe is a subject of debate. When the two passages in Joshua are understood in their historical context, the city list in Joshua 19 becomes especially interesting, simply because of its antiquity. The allotment of Simeon according to Joshua 19:1-9 is as follows. "The second lot came out for the tribe of Simeon, clan by clan. Their inheritance lay within the territory of Judah. It included: Beersheba, Moladah, Hazar Shual, Balah, Ezem, Eltolad, Bethul, Hormah, Ziklag, Beth Marcaboth, Hazar Susah, Beth Lebaoth and Sharuhen - thirteen towns and their villages. Ain, Rimmon, Ether and Ashan - four towns and their villages - and all the villages around these towns as far as Baalath Beer (Ramah in the Negev). This was the inheritance of the tribe of the Simeonites, clan by clan. The inheritance of the Simeonites was taken from the share of Judah, because Judah's portion was bigger than they needed. So the Simeonites received their inheritance within the territory of Judah." The list from Joshua 15 contains all the cities within the tribe of Judah. This list incorporates towns from within the Simeonites allotment. However, the focus rests on Judah. 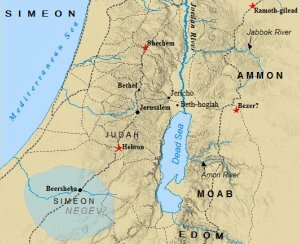 The list is divided into four geo-regions: the "southernmost towns of the tribe of Judah in the Negev"; the "western foothills", or the Shephelah; the "hill country"; and the "desert", or Judean Wilderness near the Dead Sea. Some of the same cities are found in the list of the cities in the Negev, in verses 26-32. "The southernmost towns of the tribe of Judah in the Negev toward the boundary of Edom were: .... Amam, Shema, Moladah, Hazar Gadah, Heshmon, Beth-Peler, Hazar Shual, Beersheba, Biziothiah, Baalah, Iim, Ezem, Eltolad, Kesil, Hormah, Ziklag, Madmannah, Sansannah, Lebaoth, Shilhim, Ain and Rimmon - a total of twenty-nine towns and other villages." As stated above, number of cities are found in both lists. However, one notices Ether and Ashan from the Joshua 19 passage are absent from the Joshua 15 passage. Nadav Na'aman illuminated this point in his essay, The Kingdom of Judah Under Josiah". Na'aman argued that Joshua 19 seems to be an older source than the Joshua 15 list. However, many of the towns in the town list of Simeon are also found in the town list of Judah. Na'aman states "the two lists appear to have a common source". The absence of Ether and Ashan in Joshua 15 indicate the list was compiled after the campaigns of Sennacherib in the Shephelah around 701 B.C. Na'aman concludes this on the basis many towns in the Shephelah were destroyed during this campaign. The absence of such towns in the Joshua 15 passage, thus, dates this passage sometime in the 7th century B.C., after Sennnacherib's destructive influence. It would thus appear, that only Ain and Rimmon were restored after Sennacherib swept through the area. The cities of Ether, also known as Athach, and Ashan were destroyed and abandoned. Further evidence the Joshua 19 passage may be older can be gleamed from a list of some cities within this tribe found in the book of Samuel. THE SOUTHERN NEGEV IS A LAND OF HISTORICAL SIGNIFICANCE. ABRAHAM LIVED IN BEERSHEBA, DIGGING WATER WELLS THERE TO SURVIVE. DAVID & HIS MEN LIVED IN ZIKLAG WHILE HE FLED KING SAUL. JACOB AND ESAU JOURNEYED AND LIVED IN THE NEGEV. IT IS THE HOME TO MANY OF THE EVENTS WITHIN THE BIBLE. 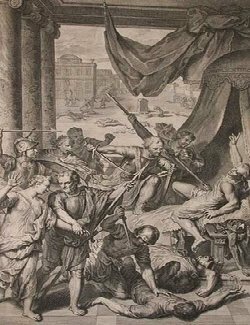 "When David arrived in Ziklag, he sent some of the plunder to the elders of Judah, who were his friends, saying, 'Here is a present for you from the plunder of the Lord's enemies.' He sent it to those who were in Bethel (Bethul), Ramoth Negev and Jattir; to those in Aroer, Siphmoth, Eshtemoa, and Racal; to those in the towns of the Jerahmeelites and the Kennites; to those in Hormah, Bor Ashan, Athach and Hebron; and to those in all the other places where David and his men roamed." The tribe is again mentioned, not by name, but in association with Judah. The influence of king David in this area is evident, as is the similarity of this list compared to the Joshua 19 list. a'aman concludes that the list of Joshua 19 was written in the second half of the eighth century, or, the second half of the seventh century. The antiquity of the list is significant to Bible scholars and theologians as it relates to the time line and time period involved in the Old Testament. The group of seventeen cities allotted to this tribe mainly rest in the western Negev.The northern border rested against the southern border of the Shephelah. The tribe settled land in the southwest of Canaan. The tribe of Judah encompassed their allotment, with Jerusalem to the northeast. The tribe of Dan lay to the north. Their land allotment was distributed by Joshua after the conquest; as was the land given to the tribes of Asher , Benjamin, Dan, Issacher, Naphtali, and Zebulon. E. Bendor Samuel illuminates the tribes of Israel like no other in his work entitled, Israel and the Blessing of the Tribes. He discusses the trials and tragedies, the triumphs and achievements, the sins and shortcomings of God's people. The Bible illuminates the tribes in a light of full disclosure, and Samuel explores that light in this wonderfully insightful book. Click on the link below to re-direct to Barnesandnoble.com and view Israel and the Blessing of the Tribes! God was very specific in the arrangement and movement of His people. Moses was the direct mouthpiece of God, and he gave each tribe explicit instructions on where they were to pitch camp, and the order in which they were to break camp. One begins to understand that nothing was left to chance by God in the establishment of His nation. The orders given can be found in Numbers 2:12-13. "The tribe of Simeon will camp next to them. The leader of the people of Simeon is Shelumiel son of Zurishaddai. His division numbers 59, 300." They were assigned to the division headed by the tribe of Reuben. They were to camp on the south of the Tent of Meeting. Reuben would be the lead tribe, followed by Simeon, followed by Gad . When it became time to move camp, they would be in the second division of tribes to break camp. The tribes assigned to the camp of Judah would break camp first. Next would come the tribes assigned to Reuben. 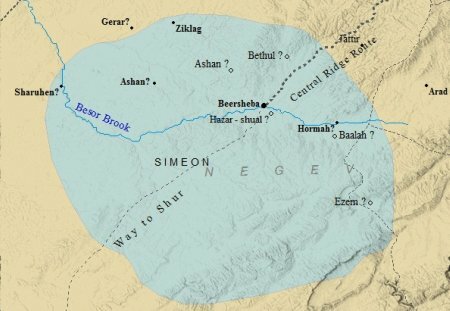 The Simeonites would be the second of these three tribes to break camp, following Reuben. Everything was meticulously planned, and efficiently executed. He was the second son of Jacob , born to Leah in Genesis 29:33. "She conceived again, and when she gave birth to a son she said, 'Because the Lord heard that I am not loved, he gave me this one too.' So she name him Simeon." The name, thus, translates as "hearing", or, "God has heard that I was unloved". As the Lord heard Leah's cries, so He gave her a second son. As the second born son, he took on an inferior role to Reuben. However, his personality seems to have been anything but meek. Scripture is silent concerning Simeon until Genesis 34. Jacob had crossed the Jordan after a happy reunion with Esau. His first stop was identical to that of his great-grandfather Abraham . He encamped his family within sight of the city of Shechem. Dinah, the only daughter of Jacob Scripture mentions, is out among the girls of Canaan one day when she is raped by Shechem, the prince of the area. Hamor, the father of Shechem, approached Jacob with the hopes of obtaining Dinah's hand in marriage. The situation greatly distressed Jacob and his sons. Interestingly, throughout the narrative Scripture indicates it was "the sons of Jacob" dealing with Hamor and Shechem. Jacob is silent throughout, and no particular brother is singled out as leader. Scripture says "Jacob's sons" conspired together, and deceived Shechem and his father. Collectively they convinced Shechem to circumcise all the men of the city of Shechem, and only then would they give Dinah to him in marriage. Scripture then relates all the men of Shechem readily agreed to this, and the city was circumcised. It is at this point the story takes a sharp turn. Seemingly, out of the shadows, emerge Levi and Simeon in verse 25. These are the only two of Jacob's sons mentioned by name in this story. The details concerning their actions are not given, only a brief description in verse 25 and 26. "Three days later, while all of them were still in pain, two of Jacob's sons Simeon and Levi, Dinah's brothers, took their swords and attacked the unsuspecting city, killing every male. They put Hamor and his son Shecehm to the sword and took Dinah from Shechem's house and left." These two brothers would would have naturally been close, being the second and third born sons of Jacob, both from Leah. Dinah, as well, was born of Leah, thus was a biological sister to the two. Scripture, however, is silent as to the planning and execution of the slaughter. The involvement of the other brothers in the initial attack is unknown. It is not presumptuous to assume these two led their respective households against the city of Shechem. Each must have possessed servants, slaves, perhaps fighting men as well. Jacob was exceedingly wealthy, and it is quite natural to assume this bled over to his sons. The remaining brothers, however, are far from innocent. Scripture makes it quite clear they were well aware of the plot against the Shechemites. They joined in the post-attack looting of Shechem and its inhabitants in verses 27-29. "The sons of Jacob came upon the dead bodies and looted the city where their sister had been defiled. They seized their flocks and herds and donkeys and everything else of theirs in the city and out in the fields. They carried off all their wealth and all their women and children, taking as plunder everything in the houses." Even in their earliest military encounters, Israel left little question they meant business. Their total annihilation of enemies is a common theme throughout the conquest, and finds precedence in the actions of Simeon and Levi . This mentality seems to have trickled down to the leaders of Israel today. Still surrounded by enemies on all sides, they will not hesitate to fight back. These actions, however, were criticized severely by Jacob. He personally addressed his two sons in verse 30. "You have brought trouble on me by making me a stench to the Canaanites and Perizzites, the people living in this land. We are few in number, and if they join forces against me and attack me, I and my household will be destroyed." Jacob's sudden concern came too late. His silence throughout the narrative seems to imply he had dropped the ball as head of the Beth-ab. He should have been at the forefront of talks with Hamor and Shechem. The brothers asked Jacob in response: "Should we have treated our sister like a prostitute?" Jacob was instructed by God to uproot and move from the area to Bethel. Jacob would later address these two together in his blessing of them (stated above). Their actions, years later, were still troubling to him. The tribe of Simeon would indeed be scattered and dispersed over the course of time. This tribe received a negative blessing from Jacob, were not mentioned by Moses, and are absent from the Song of Deborah. Many scholars feel this tribe was later absorbed by Judah. Scripture, however, never indicates such. Their allotment did lie within the borders of Judah. Oftentimes in Scripture the cities of this tribe are listed under those of Judah. This should not lead one to the conclusion they lost their identity prior to their exile. Regardless, the situation of this tribe does indicate the 12 tribes of Israel were far from a unified, cohesive unit throughout much, if not all, of their existence. The only list of the twelve tribes of Israel in the New Testament is found in Revelation 7:5-8. The tribe is represented on this list. This list is peculiar in that it lists the tribes of Joseph and Manasseh, but not Ephraim and Dan. The lists containing the twelve tribes throughout the Bible vary. 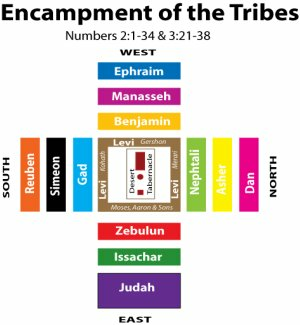 Nine tribes, however, are counted amongst the twelve tribes in every list of the Bible. Simeon is among those tribes. Their identity, thus, seems to be well established in the Biblical lists. The Bible does not seem to place much significance on the tribe, however. Further evidence of the tribe's decline can be gleamed from their numbers before and after the Exodus. Numbers 1:22 lists the descendants at 59, 300 strong prior to the Exodus. After the Israelites "began to indulge in sexual immorality with Midianite women", God's "anger burned against them". A plague broke out amidst the camp. After the plague, Moses is instructed to take another census of the tribes of Israel. Numbers 26:14 gives the number of the clans within the tribe of Simeon. In this list, they are only 22, 200 men strong. They had lost two-thirds of their men in the wilderness. The only exploits of this tribe are given in I Chronicles 4:24-43. Simeon's descendants are given in this passage. Scripture records the descendants of a grandson of Simeon, Mishma. Mishma had three sons. Of his three sons, Scripture records only one had a lot of children. Resultingly, "their entire clan did not become as numerous as the people of Judah." Further evidence of the tribe's reduced status amongst the tribes. Scripture does indicate the men listed in these records increased greatly, and their families prospered. The tribe acquired rich, good pastureland, and spacious land. Scripture records the land was peaceful and quiet, and formerly inhabited by Hamites. In the days of Hezekiah, the Bible states, Simeonites attacked the Hamites and Meunites in the area. Scripture indicates they "completely destroyed" their enemies. Later, a band of 500 Simeonites, led by Pelatiah, invaded the hill country of Seir. They are credited with killing the remaining Amalekites in the region. The Transjordanian Tribes fell victim to the campaign of Tiglath-pileser and the Assyrians. At this point, power in the northern kingdom of Israel shifted to Issachar. Simeon belonged to this northern kingdom of Israel. However, these tribes fell prey to Nebuchadnezzar and the Babylonians in 587/86 B.C. The tribe was among those exiled by Nebuchadnezzar. In this respect, Jacob's prophecy of Simeon being scattered was fulfilled. However, as stated in Revelation, the tribe of Simeon will take its place amongst the 12 tribes of Israel in the New Jerusalem.